Dental Implants are small, titanium-based, screw-shaped threaded cylinders that are placed into the bone in the upper (Maxillary) and/or lower (Mandibular) arches of the mouth. They are used to replace one or many missing teeth, or to stabilize dentures. Titanium is an inert metal that is capable of creating a very tight bond with bone. Titanium is used in other operations such as knee or hip replacements — so it is a proven surgical component. 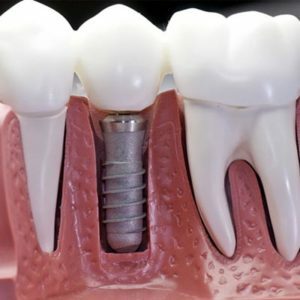 The implant acts like the root of a natural tooth, and bone actually forms around a special coating on the implant to hold the implant firmly in place. This process is referred to as osseointegration. A crown – with the look, feel, and function of a natural tooth – is then affixed to an abutment which is connected to the implant. The ‘abutment’ is simply a small connecting piece between the implant and the crown. In cases where there are multiple missing teeth, or where the patient has previously had dentures, multiple implants are placed in the mouth to allow for implant-supported crowns or bridges, ball abutment retained over-dentures, and/or bar-supported over-dentures. The success rate for dental implants is very high; and, with proper care, good dental hygiene, and a healthy life style, it is rare that implants will fail. Over the past 30 years, hundreds of thousands of implants have been placed. Many of the ‘original’ implants are still functioning without problems. Technology and procedures have advanced significantly since the first implants were placed. The success rate is now in the 95%+ range. Some reasons for failed implants can be attributed to an unhealthy lifestyle (smoking), or to poor dental hygiene. Dental Implants are easy to clean, and do not decay. Implants help to preserve adjacent natural teeth. With an implant-supported bridge, there is no need to stress or traumatize adjacent natural teeth in order to hold the bridge in place. Traditional removable partial dentures also place stress forces on the remaining natural teeth. Implants help to prevent the appearance of premature aging due to bone loss. Osteoporosis can accelerate bone loss with patients using standard or conventional dentures. Call Us at (403) 261-8855 to book your Implants consultation appointment today!